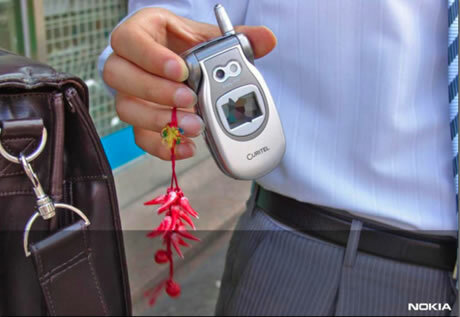 I found this very intresting research paper a Cross Cultural Study on Phone Carrying and Personalisation co-authored by Cui Yanqing and Fumiko Ichikawa which is presented at HCI International 2007 in Beijing. 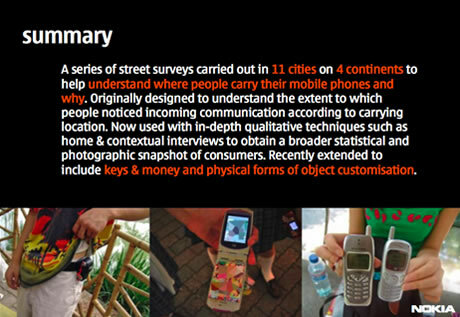 This essay presents data from a series of Nokia street surveys conducted between 2003 and 2006 that explored where people carry their mobile phones and why? 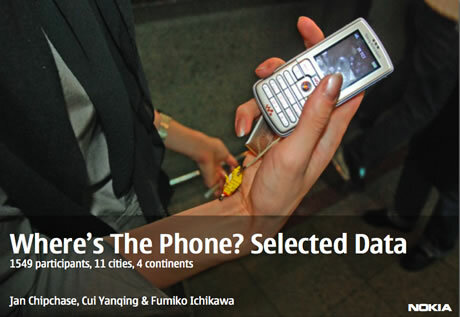 “Where’s the Phone street surveys set out to document the extent to which people noticed their incoming communication and cross refererence this information to the location where the phone is carried. 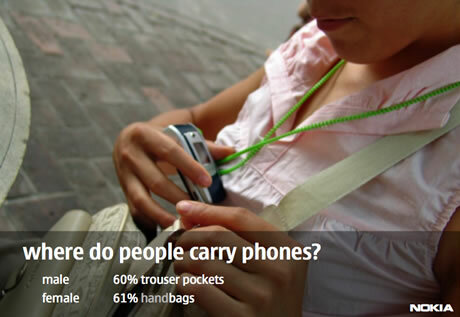 The mobile phone’s effectiveness as a communication device is partly dependent on its owner noticing incoming communication (though whether someone decides to respond to that communication is another matter entirely) and it was assumed by the authors that the process of deciding to carry an object would correlate with a minimal level of its effective use. Contexts where there was a high likelihood of missing incoming communication presented a design opportunity both in terms of thinking about device redesign and from the perspective of connectivity-related services accessed through that device. Download this pdf here as powerpoint or pdf (3MB). Read as from Jan Chipchase here. This article gives an explanation to what is good design and why it should be pursued in the first place. The article discusses the very core of design and the value that good design can bring to the end product. The article also takes a look into design today and tomorrow. An Intresting interview with Raphael Grignani of Nokia Design about Homegrown project. Must read to know about new design thinking on sustainability. Rachel Hinman, mobile design strategist at Adaptive Path, has conducted an interview with Raphael Grignani of Nokia Design about “Homegrown”, a long term research project looking at how Nokia can help people make more sustainable choices. “With Remade, Andrew Gartrell (Homegrown project lead and Remade father) pushed design beyond skin deep aesthetics. He considered covers, key mats, and displays but also engine, connectors, and other components. 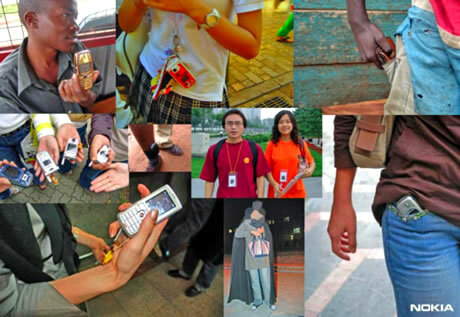 We discovered that a typical mobile phone contains around 44 of the 117 elements currently known to science. Andrew’s approach was to de-construct everything and rebuild it from scratch using recycled materials and sustainable technologies — from the inside out. 50% of a phone’s energy demand is backlighting. Another aspect of Homegrown that is really interesting is the work we did around prototyping. 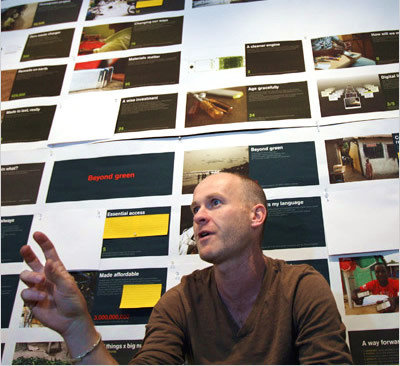 Andrew designed in CAD over 100 versions of Remade and prototyped 36 — which could be considered obsessive — but it was through that constant consideration and iteration that we were able to arrive at something that was great. At present, phone chargers waste 300mW of standby power when left unplugged. 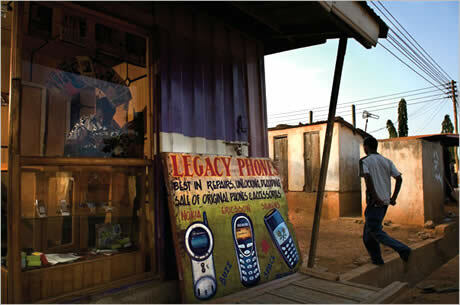 A cellphone shop in Accra, Ghana, which carries and repairs a variety of handsets. A great article via The New York Times featuring Jan Chipchase and his work style to find about how people use their cell phones, where they keep it, understanding their behaviour in terms of usability, business and Psychology many more ways . . even a simple idea can make a product more innovative and solution providing as mobile phones are getting more personalized mere just not a functional device to talk. The premise of the work is simple – get to know your potential customers as well as possible before you make a product for them. Chipchase talks to Accra street vendors about what an ideal phone. Jan Chipchase is 38, a rangy native of Britain whose broad forehead and high-slung brows combine to give him the air of someone who is quick to be amazed, which in his line of work is something of an asset. For the last seven years, he has worked for the Finnish cellphone company Nokia as a “human-behavior researcher.” He’s also sometimes referred to as a “user anthropologist.” To an outsider, the job can seem decidedly oblique. His mission, broadly defined, is to peer into the lives of other people, accumulating as much knowledge as possible about human behavior so that he can feed helpful bits of information back to the company — to the squads of designers and technologists and marketing people who may never have set foot in a Vietnamese barbershop but who would appreciate it greatly if that barber someday were to buy a Nokia. 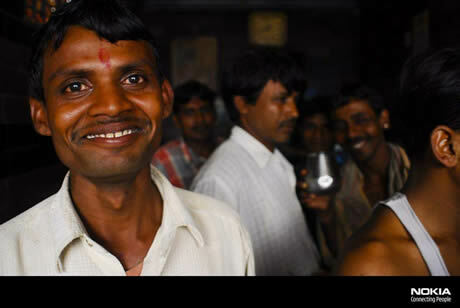 I really impressed with him, his thoughts to create innovation and more focussed for the people. A nice article on The New York Times, what mobile designers think behind the scene and workaround for “hoping to Make Phone Buyers Flip“. Forecasting what consumers will want next year, and into the future. 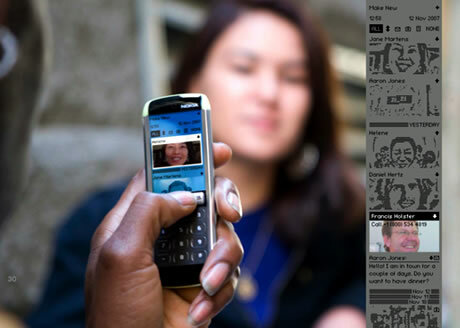 Designing a Mobile phone is just not an easy task there are many things to see, evaluate and analyze around the people. Jotting down feelings about features what users are looking for, share their emotions about mobile phone, understanding the psyche of consumers and why they pick one phone over another. Even interesting designs do not necessarily spell success. The group is the first of its kind at Nokia, the world’s No. 1 seller of mobile phones, bringing together 14 designers and researchers from California and Helsinki, where the company is headquartered. 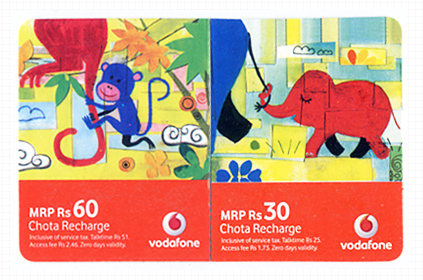 Their charge is to tell Nokia’s top executives not only what consumers will want next year, but 3 to 15 years from now. 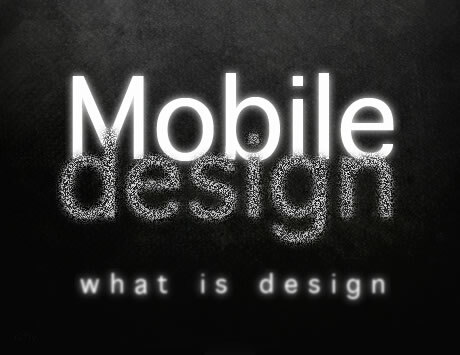 Adaptive Path’s Peter Merholz posted an article about “Don’t design for “mobile” – design for mobility”. We really need to understand that the essence of great mobile application design is understanding that a phone is always with you – not that its simply a smaller device. It’s true that we’re missing big opportunities when we design for the device, and not for the context in which the device is being used! !